MSA 30X Sound Amplifier Review: Is It Worth Your Money? The MSA 30X hearing amplifier is one of the most popular devices in the sound amplifier market. And like other hearing amplifiers, it helps to increase the volumes of sounds around you. That’s basically all that it does. 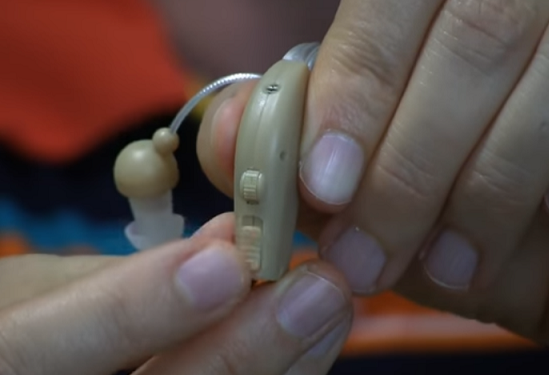 But since many people with hearing impairment have claimed to have found these devices helpful, this might just be worth trying out if you’re having some hearing problems. Now, I won’t go ahead to recommend the product without checking it out and telling you everything you need to know about it. So, I checked out the device and detailed my findings in this review. Read on to know everything I found out about the MSA 30X hearing amplifier, and to figure out if you should buy it or not. According to the manufacturer, the MSA 30X amplifier can make sounds up to 30 times louder (and that explains the “30X” part of it name). However, bear in mind that this product isn’t promoted as a hearing aid, and it’s not intended to be one. Audiologist-prescribed hearing aids are the most widely highly recommended solutions for people with hearing loss. 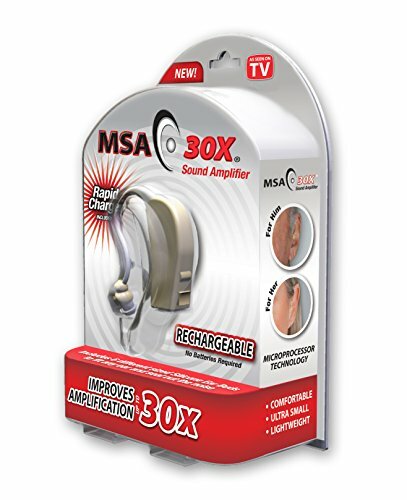 But because hearing aids cost far more than what most people can afford, the demand for hearing amplifiers like the MSA 30X is on the increase. The FDA warns, however, that these “over-the-counter” hearing devices are not regulated, so buyers will only be using them at risk. But from what I’ve found out, the market now abounds with hearing amplifiers of different types and by different brands. While some of them have been widely described as “better than hearing aids”, others have disappointed their buyers. So, it’s been mixed stories so far. Let’s see where the MSA 30X belongs. The MSA 30X sound amplifier comes in a simple but attractive pack, which contains the amplifier itself, the charging set, a cleaning brush, and a small transparent bag containing six extra silicon buds of various sizes. The charging set comprises a dock and a plug, with a wire connecting both together. The hearing amplifier device itself comprises an enhancer (the “body” of the device) and an earpiece with an earbud attached for user comfort and optimal amplification of sounds. On the product pack, it’s clearly stated that the device isn’t meant to be a replacement for prescription hearing aids, just as I mentioned earlier. So, I think the manufacturer is being clear and ethical here. As stated earlier, the device comprises a sound enhancer and an earpiece. Overall, it’s a small device (smaller than the average adult finger), but I must admit that it’s not the smallest I’ve seen. So, it won’t win any awards for micro or nano size. It’s lightweight, though. Drop it in your chest pocket, and you won’t feel a thing. Just so you know, the whole unit is a BTE (behind-the-ear) hearing device, which means the body of the device sits comfortably behind your outer ear, while the earpiece is drawn over your ear to fit into your ear canal. The earpiece is held in position by the earbud, which comes in various sizes included in the pack. The body of the device and the earpiece are connected by a shiny flexible cable. On looking at the side of the device, I saw two buttons — the volume adjustment button above, and the on/off button below. Looking around the body, I could see the small screws used to hold it together. While this won’t cause any issues for the user, I think they should have been concealed. Does the MSA 30X Sound Amplifier Really Work? Well, when I tested the device with my TV set at a very low volume, it did amplify the sounds, so I could hear them better. But when I powered the device after increasing the volume of the TV a bit, the sound was deafening. Yes, so loud it could damage my ears if I let it stay that way for too long. So, the MSA 30X really delivered on its promise to amplify sounds in the user’s surroundings. But did I have any issues with the device? Yes, I had a number of issues. First, there was this hissing sound in the background, which won’t go until I lowered the volume of the device. But despite that, voices or sounds from TV can be clearly heard over it. I wouldn’t know if it was because I’m having no issues with my hearing (more like the discomfort felt by someone with normal sight after wearing recommended glasses). Second, the device picked up my own voice and breathing as well as every other noise around, and I just wasn’t comfortable with that. In other words, the device couldn’t filter out unwanted sounds. But then, expecting that would mean asking for too much, given the cheap price. The few hearing amplifiers I know that are capable of doing that perfectly cost a few hundred bucks — far more than the price of this device. As for the battery, I can’t say much about that since I didn’t get to use the device for long. (Of course, my hearing is normal.) But I’ll reveal what other buyers have said about it later in this article. I’ve realized that one reason why most people don’t get what they expect from tech devices is wrong usage. So, I deemed it necessary to include this short guide on how to use the MSA 30X sound amplifier. So, here are the steps to follow. Unbox the device and its accompanying accessories. Hold the earpiece, and try to insert the earbud in your ear (the device works with either ear). The earbud must fit well in your ear canal, so that all sounds are forced to pass through the circuitry of the enhancer. If the earbud doesn’t fit well in your ear, you need to check the extra buds for the appropriate size. Now, place the body of the device right behind your outer ear, pass the connecting string right over your ear, and insert the earbud into your ear canal until it fits tightly. Roll to the volume button to the lowest. Turn on the device, and slightly increase the volume until you get to a point you’re comfortable with. If there are no sounds around you to test the device with, switch on your TV or radio. Be sure to lower the volume to a point where you can hardly pick up anything without the device on. Then power on the device to test its sound amplification function. To charge the device, simply tuck the lower end of the enhancer into the USB charging dock, and plug the charger into an AC power source, and you’re good to go. When the indicator on the dock turns green, it means the battery is full and charging should be stopped. MSA 30X Sound Amplifier: What Are Other Buyers Saying? 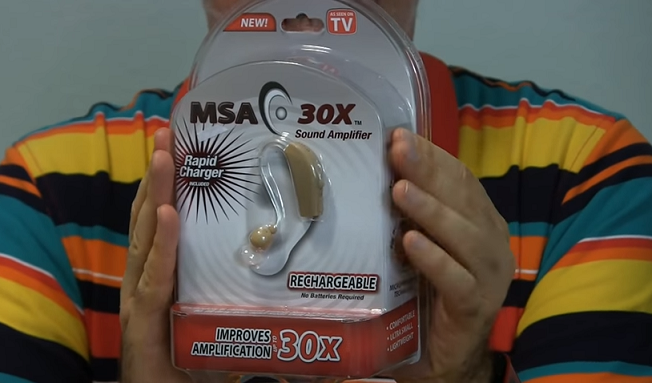 I didn’t want to draw a conclusion on the MSA 30X hearing amplifier based on my own experience and opinion alone. So, I decided to check the product page on Amazon to see what other buyers had to say about the device. If the average rating as at the time of this writing is anything to go by, then one would conclude that the device is an average product at best. As one would expect from a product that is “average” in terms of function, I found a mix of good and bad reviews left by satisfied and disgruntled buyers, respectively. While some people complained about the constant hissing sounds in the background, the most common complaint I found about the product is that it amplified all sounds in the surroundings and didn’t filter out unwanted sounds (so, I’m not alone here). But in truth, you get what you pay for. How on earth would you expect a device that costs less than $50 to identify and filter out unwanted sounds? To me, that’s asking for too much. If you really want that, then go for more sophisticated devices like the Empower Hearing Amplifier, or get a prescription hearing aid for a few thousand bucks! On the other hand, many buyers loved the product for its affordable price. A number of buyers with moderate to severe hearing loss claimed that they actually found the product helpful. So, I deduced that people with mild hearing loss tend to find the product “noisy”, but those with advanced hearing loss found it just perfect. Another aspect of the device that has impressed many users is the battery life. According to them, the device delivers for about 8 hours of non-stop use after a full charge. To me, that’s great for a product of its price. 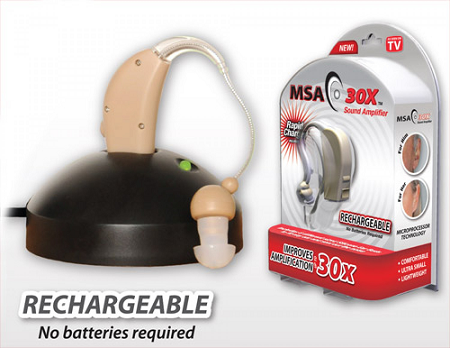 The MSA 30X hearing amplifier is quite affordable, packs an impressive battery, and amplifies sounds significantly. For its price, it’s no doubt a great device for anyone looking for a dirt cheap alternative to prescription hearing aids. But the major downside which I and many other buyers have complained about is the fact that unwanted background sounds are also amplified, and this makes the user uncomfortable. Only people with moderate to severe hearing loss wouldn’t have this issue. As for me, I would pass on this one. And I’d advise that you do, too — since you’re not sure if it will work for you or not. If you’re looking for hearing amplifiers that better and pack awesome features, then consider the Empower Hearing Amplifier and others on this page. But if you’re on a tight budget, check out our review of cheap hearing amplifiers that work well. Banglijian Hearing Amplifier Ziv-201 Review: Does It Work? Otofonix Hearing Amplifier Review 2019: Is It Worth Buying? Empower Hearing Amplifier Review: Is It Worth Your Money? HearingAmplifierReviews.com is a participant in the Amazon affiliate program, which means we get a commission if you click through any of the Amazon.com links on this website and ultimately make a purchase. This however does not affect the quality of the information we share on the site, and it does not affect the price you will pay for any product. We only use the commissions to support the site, so we can continue to provide helpful reviews of personal hearing amplifiers and related products. Copyright © 2019 • Hearing Amplifier Reviews • All rights reserved.